Teen actors Nikki Si'ulepa and Toby Fisher won acclaim in Ian Mune's fourth feature as director. Si'ulepa plays a Samoan street kid who meets a well-off white teen, when both are facing mortality in a hospital ward. The co-production between NZ and Canada (where it debuted on cable TV) won over critics in both nations. "Si'ulepa dominates the camera and the action with a natural authority", raved Metro. Moon scooped the gongs at the 1996 TV Guide Awards (including for originating screenwriter Richard Lymposs); and won notice at Berlin and Giffoni film festivals. Seventeen-year-old Timothy (Dean O'Gorman from Pork Pie) is facing suspension after a misguided prank. His parents hope the French-Canadian exchange student they’re hosting will settle Tim down, but when ‘Michel’ turns out to be ‘Michelle’ — and spunky — plans go awry. Coming of age and cross-cultural comedy ensues as Tim tries to court his Montreal mademoiselle. 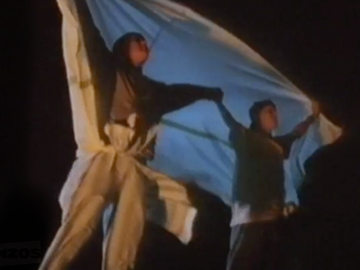 Shot around Avondale College, the award-winning NZ-Canadian film got a special mention from the Children’s Jury at the 1996 Berlin Film Festival. The cast includes Angela Bloomfield and Milan Borich.